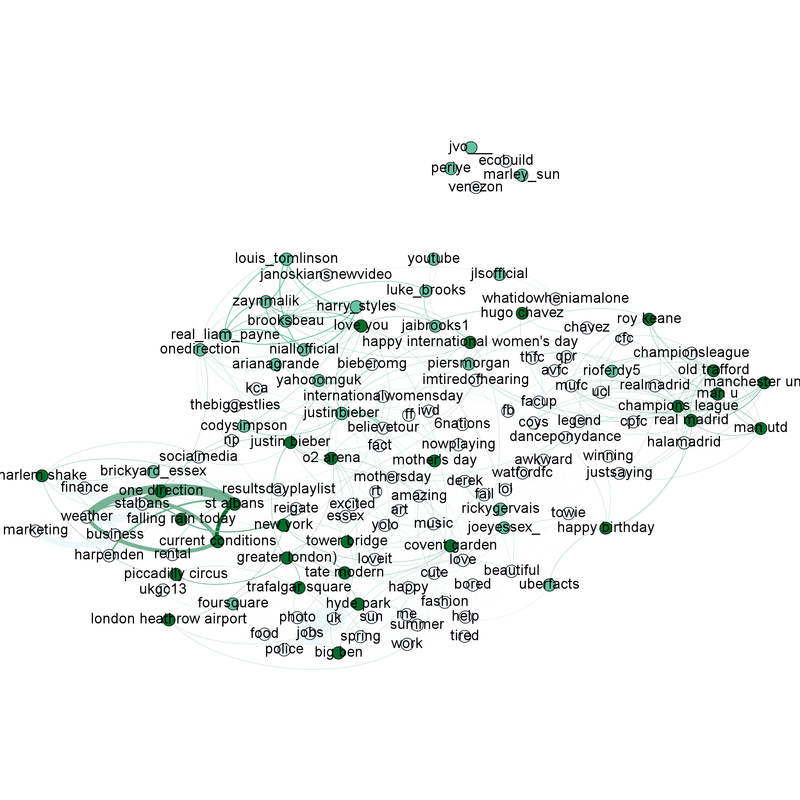 Below I’ve visualised tweets for #PyData conference and the cities of London and Brighton – this builds on my ‘concept cloud‘ from a few days ago at the #PyCon conference. Props to Maksim for his Social Media Analysis tutorial for inspiration. Update – Maksim’s Analying Social Networks tutorial video is online. 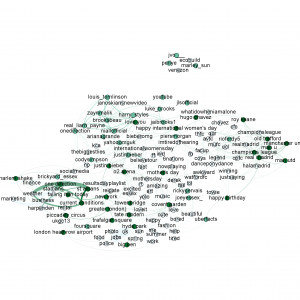 For the earlier #PyCon 2013 analysis I visualised #hashtags and @usernames from #pycon tagged tweets during the conference. I’ve built upon this to add some natural language processing for ‘noun phrase extraction’ which I detail below – this helps me to pull out phrases that are descriptive but haven’t been tagged. It also helps us to see which people are connected with which subjects. For the PyCon analysis I collected 22k tweets, after removing retweets I was left with 7,853 for analysis. 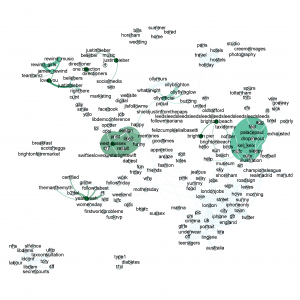 We see a cluster of references around @fperez_org (Fernando Perez of IPython), one cluster is around @swcarpentry (the scientist-friendly software carpentry movement), the other is around IPython and the IPython Notebook (@minrk of IPython/parallel is linked too). I like the connection to Julia – Fernando discussed during his keynote that Julia now interoperates with Python. The day before we had Peter Norvig (Director of research at Google) giving a keynote on the use of Python in education at Udacity including a discussion of how machine learning could be used to identify the mistakes that new coders make so we could make friendlier error messages to help students correct their code. See the clustering around this at the top of the graph. Later the same day Henrik (@brinkar) spoke on Wise.io‘s Random Forest classifier. Their approach was efficient enough to demo live on a RaspberryPi. The connection from Peter to Henrik goes via #venturebeat who covered wise.io’s new software release during the conference. Connecting IPython and Wise.io is @ogrisel (Olivier Grisel) of scikit-learn. He gave an impressive (and given the variability of conference wifi – slightly ballsy) live demo of scaling a machine learning system via IPython Parallel on EC2. In the middle we see @teoliphant (Travis Oliphant) joined to Continuum (his company). 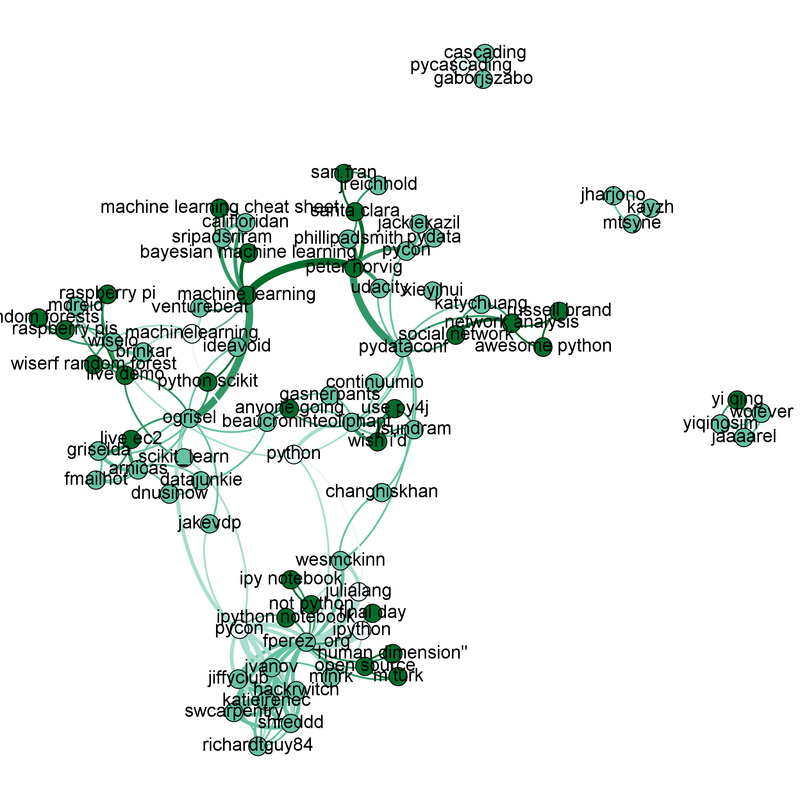 Off to the right I get to blow my own trumpet – the phrases “awesome python” and “network analysis” connect to “russel brand” which is how one wag described my lightning talk. I got a chance to demo the earlier version of this at the end of @katychuang‘s talk on networkx. All the code is in github at twitter_networkx_concept_map including the one line cURL command to capture the data. 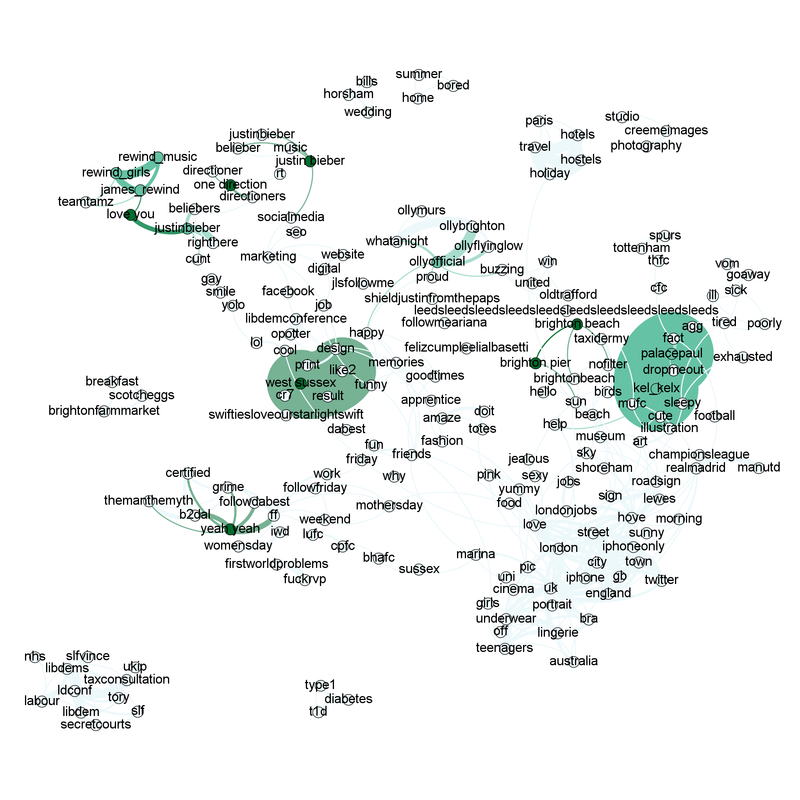 An example .gephi file is included for visualisation in Gephi. 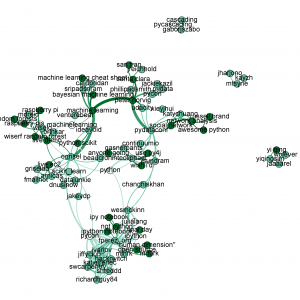 The built-in networkx viewer (optionally using GraphViz) works reasonably well but isn’t interactive. Maksim’s tutorial and utils class were jolly useful (utils is in my repo), I’m also using twitter-text-python for parsing @usernames, #hashtags and URLs from the tweets. If you want some custom work around this, give me a shout via Mor Consulting.